The Ninth Life nutritional pet vitamin supplements are the BEST thing you can do for your pets. They will give your pet the tools necessary to fight free radicals and ward off serious health problems. The key to our healthy, tasty powder is in the ingredients. All natural organic minerals and herbs, natural healers for thousands of years, blended using pure human-grade ingredients. We don't use any synthetics in our supplement! Our ingredients are formulated to provide a healthy supplement full of antioxidants to help boost your pet's immune system and protect them against the destructive effects of pollutants which allow free radicals to invade their bodies. 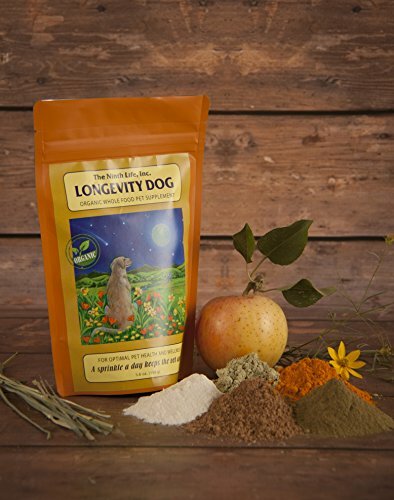 Our supplement has been veterinarian and herbologist tested and approved. Unlike most supplements you find today, ours are 100% pure. We don't put any fillers in. A simple, pure, organic blend of vitamins, minerals and herbs that will gently restore your pets balance by supporting their body's innate ability to heal itself by combating free radicals with antioxidants. Things you should know about Ninth Life products: We are veterinarian approved and tested. We never use chemicals, synthetics, toxic preservatives, or fillers. We use 100% certified organic human grade ingredients in every product. We believe in the Environment and World sustainability. If you're looking for a truly supreme organic and natural pet vitamin supplement that is formulated to promote and sustain good health in your pet you've come to the right place. Our dog and cat vitamins will give your pet the supplements necessary to live longer, healthy lives, combat diseases, and premature aging. And your pets will love the taste! 99% of pets love it from the beginning. For the 1% that don't, we recommend to start out slow with a fraction of the recommended dosage and increase gradually. This has worked every single time for the 1% who are super finicky! We guarantee it!